Now that spring is here we can………well we can wait. The ground is almost fully thawed (I know this because my Rhodos tell me so) but it’s still too early to start digging in the soil – to do so could harm its delicate structure. So what then is a restless gardener to do? Some will busy themselves with tasks from spring ‘to do lists’ posted by local gardening sites/blogs. Others pore over mail order catalogues and websites looking for inspiration. And we all try to visualize the dozens of new plants we’ll surely add to our gardens this year – as if the addition of new plant material will magically solve any dissatisfaction we had with last year’s garden. Sometimes it does, but more often not – good designs don’t begin there. 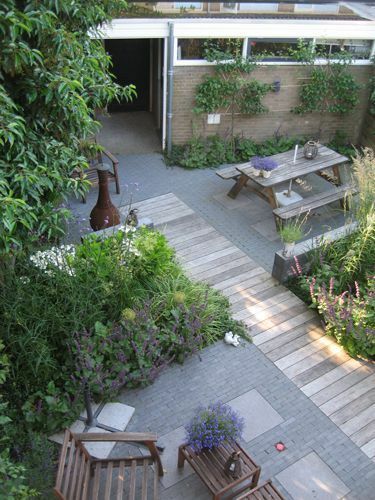 Most gardeners fail to understand that good design isn’t about manipulating plants, it’s about manipulating space. And good use of space begins with……..the ‘f-word’. That’s right – function. As gardeners, we often arrive at function last – perhaps if we’d considered it first we’d be much happier with our gardens. So we need to ask ourselves, “What is it we want to achieve here?” How do we want to utilize our outdoor space? For example, do we want a place to sit and relax? If so, do we want sun or shade? And since the sunny and shady spots in our yards will be determined by the direction of the sun at any given time of day, what time of day are we most likely to be sitting outside? Do we need some lawn for children to play on, a place for Fido to call his own, a dining space, an entertainment space, a space to grow vegetables, a utility space etc.? It can be helpful to map this out on paper – in fact a ‘functional drawing’ is the first step in the design process. It’s the ‘where everything goes’ phase and the site’s individual attributes will often determine where a particular functional space will be best located. For instance, a vegetable garden needs a considerable amount of sun, and young children will need a shadier spot. A dining space we’ll probably want conveniently close to the house and out of the wind, and the garbage, compost, workspace etc. we may want further away and out of sight. And be sure to allow enough room for a given space to fulfill its intended function – without creating areas that will be awkward to maintain or difficult to access. For example, a patio should be large enough that chairs can be pushed out from the table after a meal, a front walkway wide enough for 2 people to walk on, and a mixed shrub bed large enough to accommodate average-size shrubs (with a mature spread of 4-6 feet). The site itself often determines where a particular landscape element is most appropriately situated. In this example, the house, the garage and the existing wall create a semi-enclosed space perfectly suited to a sitting area. Note that each space is still formless and depicted only by a simple oval shape, a bubble if you will. Indeed a functional drawing is often referred to as a ‘bubble diagram’. Once you have sketched your map of functional spaces you can begin to give each space form in a Concept Drawing. A concept drawing outlines the shape of patios, walkways, garden beds etc.. This is where the real creativity in garden design begins, and yet gardeners are often stumped at this point – where do we begin? Gardeners limit themselves unnecessarily by ruling out all but curving design lines – curves are indeed a sensuous type of line, but they aren’t the only design line to choose from. In fact curvilinear designs aren’t always the best choice and more often than not, they are executed poorly. Let’s look again at the real life example – since the space articulated by the house, garage and wall is rectangular, the best place to start is with a design concept that includes some straight lines. Those who lack design training might advise you that straight lines aren’t good garden lines, claiming that ‘there are no straight lines in nature’, but just take a look at a blade of grass, a leaf vein, rock face, tree branch, a pine or spruce needle, a thorn, etc. – of course they may not be truly straight, but perceptually they are straight and quite likely as straight or straighter than any line we might carve out in our gardens. Okay point made. There are a number of design themes that include straight lines, but the 3 basic ones are Rectilinear, Angular/Diagonal and Arc & Tangent. Using the abovementioned Functional Diagram, I presented three possible options to my clients. A Rectilinear design theme consists of shapes and lines that establish 90 degree relationships to each other and to the house or adjacent building. Here these lines are used to create a quadripartite courtyard design. An Angular design theme consists of lines drawn at 45 or 60 degrees to the house, but 90 degrees or more to each other. To avoid the use of acute angles (less than 90 degrees), some lines will necessarily be perpendicular to the house. The Arc & Tangent design theme is made up of arcs (¼ circle, ½ circle and/or ¾ circle) and straight lines that are tangent to those arcs. The Rectilinear theme and the Arc & Tangent theme relate well to each other so the client could, in this case, have the best of both. An additional rectangular bed was added to incorporate the existing gas lamp into the design. Let’s look at the above three design themes in a little more detail. Rectilinear form has received a bad rap – perhaps because its straight lines are associated with the straight narrow strips of soil against the house or fence that our mothers or grandmothers called their gardens. In reality this design form is made up of adjacent and/or overlapping squares and rectangles, which create much more interesting design lines. The above two examples are small-scale urban applications of this design form, but it can be equally as applicable on a larger scale with a more ‘rural’ feel – check out this link for some lovely examples. This design theme has a strong angular component, although all lines don’t need to be angled – sometimes a single purposeful angled line can achieve that angular component quite nicely. Ideally a diagonal design is just a rectilinear design, but rotated 45 or 60 degrees. There are a number of scenarios this form works well for, e.g. a property that is disproportionately longer than it is wide. The long straight property lines draw our eye directly to the back of the property, but when angled design lines are used, the angled bearing encourages the eye to move along a less direct path, detracting from the site’s long narrow configuration. Another example where a diagonal or angular theme would be appropriate is a site with an angled property line. A long narrow yard can feel a bit like a bowling alley – making use of an angular or diagonal concept can diminish this effect by drawing the eye away from the back of the yard. The North property line angles at approximately 30/60 degrees to the house so an angular design theme using that same angle worked very well here. For a couple of good photographic examples of angular designs, click here and here. This design theme is made up of arcs and straight lines – an arc and tangent concept can be thought of as a rectilinear theme with arcs inserted into some of the corners. The arcs can be ¼ circles, ½ circles or ¾ circles and should be large enough that it actually looks like lines and arcs and not just right angles with slightly bevelled corners. The easiest way to arrive at an arc & tangent concept is to begin with a rectilinear theme and insert arcs into some of the corners. I find that photographing this design form is tricky because of the role perspective plays – the straight lines don’t always look truly tangent to the arcs. Below are a couple of photos from several years ago. 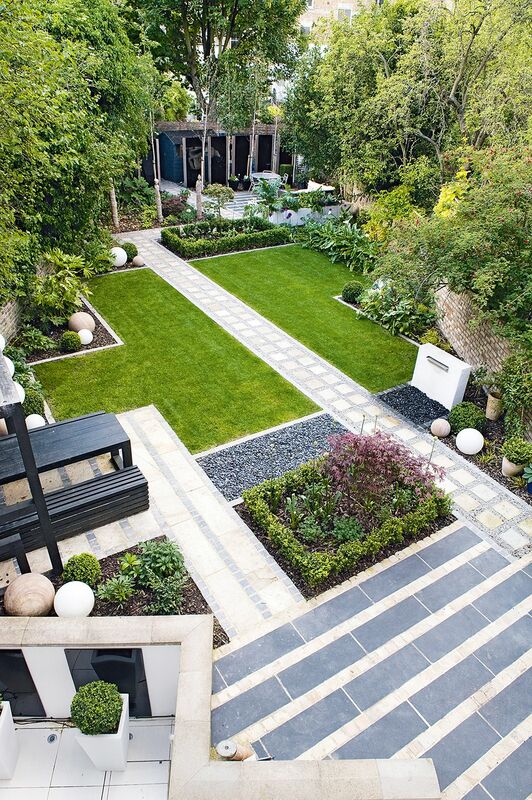 So there you have it – a case for straight lines in the garden. Next post I’ll cover a couple of the curving design themes. In the meantime, try playing with new lines for your garden – on paper of course. And don’t be afraid to think outside the box – or maybe I should say ‘inside the box’. This entry was posted in Design Process and Principles and tagged Angular Garden Design, Arc and Tangent Garden Design, Design, Garden, Garden Concept Plans, Garden design, Gardening, Landscape design, Rectilinear Garden Design. timely article as I am working on some designs and am now inspired with your expertise and blog information; blog, such a harsh word for valuable free information! I’m really pleased to hear you are working on some designs – nice to know that some of my thoughts on the subject are inspiring you. Hi Sue, I hadn’t read all your posts yet as of today but after reading the first one I read through them all this morning. Great info, great pictures and each one is like a little mini-class. Love it! Now i’m inspired again. Can’t wait to read more. Happy Spring! Thanks for reading all the posts – I know they are really long, but I’m pleased to hear you are feeling inspired again. I’m sure the lovely spring weather helps too! Maybe see you in Design Level 2 in the fall? I am in the middle of a gardening course and this page has answered many questions that has been going round and round in my head. I’m happy to hear that this post was helpful to you – ‘line’ is one of the basic elements of design and understanding its importance can help us to move forward in the design process. Best of luck in your course and do visit again! I loved your blog and your drawings. They were very helpful to me in the school assignment that I am doing. Thanks for your ideas. One of the reasons I started this blog was so my former design students could have continued access to design advice, but I’m pleased to hear that other design students, like you, have found their way here too – welcome! Hope you find reason to return, and thanks for your lovely comment. Great article, Thanks for another thorough and informative article, with beautiful pictures. I love your blog and your drawings. Thanks for your ideas.